As everyone knows, The Old Bride has spent the last month hyper-focused on fish dishes. I wasn’t quite finished, because after the Winter of Deepfreeze, crawfish season has begun in earnest in Oxford. And despite the slight delay, they certainly are tasty. This week’s dish was inspired both by research into olive oils for a feature on the topic, and by some good fishy leftovers — a fresh two-pound red snapper from my latest fish order at L&B Meat Market, and a generous cup of crawfish tails left over from last weekend’s 8-pound order of boiled crawfish purchased from the P-Reaux food truck on College Hill Road. 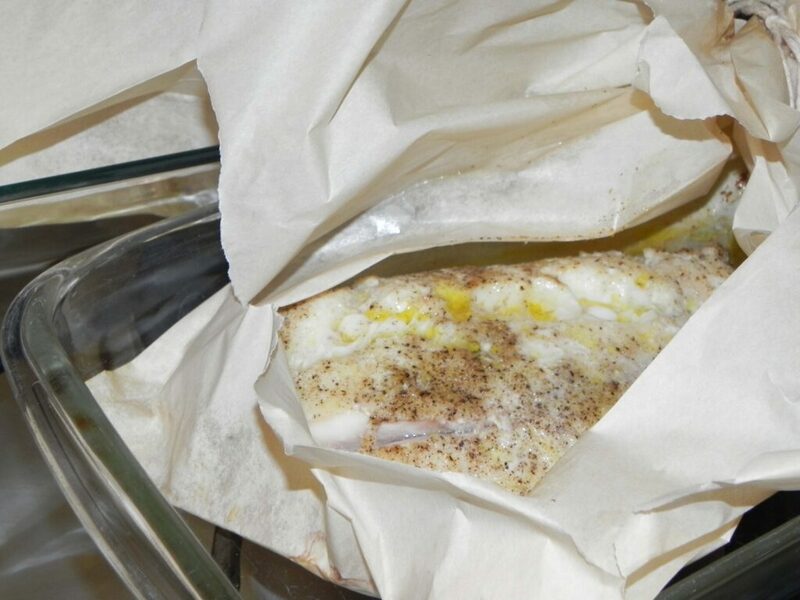 The snapper was perfect for seasoning with high quality olive oil and baking en papillote. I topped it with steamed asparagus and a crawfish sauce to create a snapper version of Oscar (the veal, asparagus and lobster/crab dish served with Béarnaise Sauce, created for 19th century King Oscar II of Norway and Sweden). Preheat oven to375˚F. Prepare the asparagus for steaming by breaking off woody stems at bottom. Use a vegetable peeler to lightly scrape fibrous exterior at lower portion of asparagus (not necessary if the asparagus are thin and very fresh). Place in steamer basket set in pot with water not touching the steamer. Set pot aside. Prepare red snapper by drizzling all over with the Tuscan herbs-infused olive oil. Dust with salt, pepper and garlic powder. Position the prepped fish in oven parchment bags. Twist open end and tie it closed with twine. Place bags in separate 7-by-11-inch baking dishes or one 9-by-13-inch dish. Bake in oven on middle rack about 25 minutes, until bags are fully puffed from the steam. While fish is baking, set asparagus pot on medium-high heat. It will take about 10 minutes to steam; turn off heat and leave covered until ready to use. Melt butter in a frying pan. Sauté the crawfish tails briefly in butter and sprinkle with flour, stirring to blend and remove lumps. Whisk in wine and simmer 5 minutes. Lightly beat the egg yolk and temper with a teaspoon of the hot butter mixture. Stir the tempered egg into the pan, whisking gently to blend and prevent curdling. Whisk in lemon juice, and a pinch of cayenne pepper. Simmer about 5 minutes, stirring, and add cream, stirring until the crawfish gravy becomes smooth and thickened. Turn off burner. Remove fish from oven, cut open the bags and carefully remove fish with large spatula to plates. Position three to five asparagus spears across each fish, and ladle crawfish gravy over the asparagus. Garnish with fresh chopped parsley, to taste. Serve with steamed rice and crusty bread. Yields 2 to 3 servings. If you can’t get to the olive oil store, try making your own infused olive oils. This recipe calls for Tuscan Herbs, but feel free to experiment, for instance, with three peeled garlic cloves or three to four sprigs of fresh basil instead of the spices below. 1 split clove of garlic (remove the germ from clove center). Combine all ingredients in a sterile glass container. Cover and infuse for 2 weeks. Straining the oil into a stainless steel or dark-colored glass dispenser for ongoing use. Store away from light and away from heat (definitely not near the stove). New olive oils are best for about 6 weeks following the time the oil has been exposed to air.